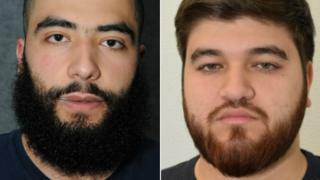 Two men from Sheffield who sent money to Syria to fund terrorism have been given jail sentences. Abdurahman Kaabar and Badroddin Kazkaz sent money to Kaabar's brother after he left the UK to "engage in violent Jihadi activity". Sheffield Crown Court previously heard Kaabar, a former dental student, also gathered and shared a "breathtaking" amount of terrorist-related material. Kaabar, 24, was jailed for eight years, with Kazkaz sentenced to four years. Kabaar, of Martin Street, Upperthorpe, Sheffield, admitted 15 offences relating to disseminating or possessing material likely to be useful to a person committing or preparing an act of terrorism. The former Plymouth University dental student was found guilty by jury of two counts of terrorist fundraising relating to cash sent to his brother in Syria. Kazkaz, 23, of Cross Myrtle Road, Heeley, Sheffield pleaded guilty to a similar terrorism funding offence. During the trial, jurors heard Mohammed Kaabar had left the UK in March 2016 to fight against the Syrian government. He went with another man, Ahmed Hadrami, who sent messages to say he went to Idlib in north-west Syria "to sacrifice myself for Allah's religion". Kaabar and Kazkaz sent money to Mohammed Kaabar between September 2016 and January 2017. Judge Paul Watson QC said Kaabar had been found with documents giving instructions for knife attacks and bomb making, with the cash sent abroad "for a terrorist purpose". Sentencing him, the judge said: "It was clear that you had wed yourself to a corrupt and corrosive ideology of Islamic extremism. The volume of material which you downloaded and kept in your possession was frankly breathtaking and the content of which was horrific."